An Affidavit is simply a sworn statement made in writing. An Affidavit can be used for many reasons including attestation of birth, death, a place of residence, or to provide evidence in a trial by law. Depending on the type of affidavit and the laws in the jurisdiction, the affidavit may need to be signed in front of certain witnesses, including officers of the law, to be legally binding. An affidavit is a sworn statement made voluntarily in writing. The party giving the written statement declares the facts stated are true and confirms this under oath. It must be signed before an officer who is empowered to administer such oaths. The most commonly used statement is a general affidavit. This is seconded by a small estate affidavit. One way to think about an affidavit is to compare it to testifying in court. When you’re called to testify in court proceedings, you swear that "you are telling the truth and nothing but the truth." So, you’re using a verbal oath to promise you’re going to tell the truth. With an affidavit, you are making the same type of promise in writing. An affidavit form may be used in many different scenarios. In business, it is often used to confirm the financial security of an individual applying for a credit card, or the financial status of a corporation. Within the judicial system, it is generally used as evidence in trials and hearings. An affidavit form may also be used as evidence in administrative and quasi-judicial proceedings. However, this only happens if no objection is made to its use and if it is subject to cross-examination. Because an affidavit is a legal statement, it verifies your personal information for identification purposes. This may include your full legal name, date of birth, age, and may also include your Social Security Number in some instances. Affidavits must be signed by the affiant (the person making the sworn statement) in front of a notary. A statutory declaration is a form of affidavit. It serves the same basic purpose. The difference between an affidavit and a statutory declaration is that a statutory declaration is used in Australia, Canada, and the United Kingdom. An affidavit is used in the United States. 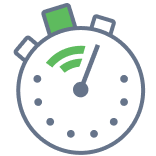 Create a free Affidavit in minutes with our professional document builder. Affidavits are, in many ways, very simple, but in other circumstances, they can be rather complicated. This guide is designed to walk you through all of the information you need in order to write one. It's also helpful to use a sample affidavit form to guide you. We will cover their common uses, required parties, tips for writing your own, and common forms. When Should You Use an Affidavit? Affidavit of Domicile: Commonly used when probating a will or navigating multiple trusts. This affidavit establishes the legal residence of the deceased at the time of their death. This type of affidavit may be state specific. Affidavit of Heirship: Commonly used in estate planning. Typically, this affidavit is used to establish legal heirship of the deceased if they died without a valid will. Affidavit of Marriage: Declares that two individuals are legally married. These affidavits are commonly used when a married couple cannot find their marriage certificate. Make sure you read the affidavit thoroughly before signing. Look carefully at what the affidavit requires and be sure you can comply with all the included provisions (e.g. having your picture published, etc.). During the legal separation and divorce process, you will provide a financial affidavit. The affidavit components include information about your: income, expenses, assets (such as real property, bank accounts, and retirement accounts), and debts. Depending on your circumstance, that may not be a complete list of items that you'll need to address. Financial affidavits are used to determine how assets and debts will be divided between the former spouses. If you’re not truthful in this document and try to hide assets, the court may impose severe penalties, including awarding 100% of hidden assets to your former spouse. Financial affidavits require very specific information, including detailed itemization of all expenses in each of the previously mentioned categories. Regulations vary by state. Financial affidavits may be called something slightly different in your jurisdiction. Your divorce attorney will only review this affidavit for major mistakes. It is your responsibility to ensure all of the information is complete and accurate. You can revise your financial affidavit if your financial circumstances change, even after you file it with the court. What are the Components of an Affidavit? If you must write or sign an affidavit that's in a standard format, you definitely need to be familiar with the main components of the document. After all, it is a legal document that could involve serious consequences if any of its key components are missing, incomplete, or not truthful. Whether the form is used as written, sworn testimony, a health insurance verification letter, the photo page of a passport, a lease agreement, a mortgage application, or even in a reference letter where you answer some simple questions, it is important to ensure that all of the sections are included. To begin, the document should have a title at or near the top of the first page. This title should make it clear that it is an affidavit. Under the title, the name of the affiant (the individual attesting to the truthfulness of whatever is stated in the document) should be listed. The names of any other necessary parties involved should also be documented. 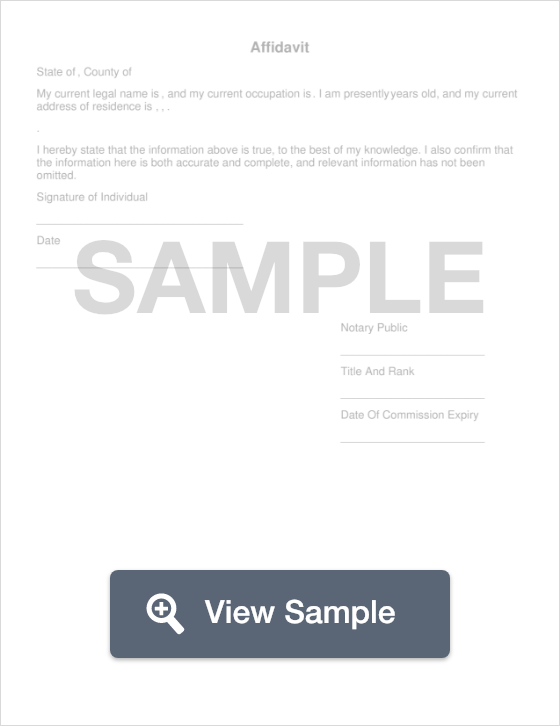 There may also be other identifying information contained at the top of the form, depending on the intended use of the form. Underneath the title and identifying information you’ll find the main part of the document. This contains the affirmation. It is usually made up of one or more “I” statements. This part of the document is written in first person. It literally explains what the affiant is swearing as true information. In this part of the document, the affiant will "attest" or swear that they believe the information within the document is true to the best of their knowledge. The acknowledged statement(s) needs to be as clear and detailed as possible. Most importantly, they must be fully accurate. Otherwise, the affiant could be charged with the crime of perjury. That’s why you’ll find language declaring that the affiant is acknowledging the truthfulness of the statement(s) under penalty of perjury, fine, and/or imprisonment. This is a normal part of an affidavit. If the signer is telling the truth, they have nothing to worry about. If there are supporting documents, you must organize them and label them by letter (Exhibit A, Exhibit B, etc.). Reference them by label when necessary and attach them to the end of the final physical document. The document is useless if it isn’t signed by the affiant. This is done in a certification section. There, the affiant will sign their legal name and include the date they sign the document. There may also be a spot for one or more witnesses. This can enhance the legal validity of the document. However, the signing of the document should not be done until the affiant (and any witnesses) are in front of the notary. The final component is the section reserved for a notary public. The notary affirms that the affiant is voluntarily signing the document in the notary’s presence. This part of the form must have enough room for the notary to sign, date, and stamp the document. In most states, a notary will also need a space where they write their state issued notary ID number. All of these components can be seen on just about any free form downloaded from the Internet. To find a free affidavit on the Internet, make sure that you include your state in your search. You want to find a basic template that should match the needs for your state. Make sure that all of the key components listed above are included in the document if you plan to use it. Checking for all of the important sections in your affidavit can save you from some serious problems. Read it carefully now—or deal with the potential consequences later. Grammar: Write in first person. This means that you use “I “ statements. For example, I saw the red Honda Accord run the stop sign at Main and First Streets. It hit a green Toyota pick-up truck on the passenger side. Introduction: Affidavits typically begin with a brief background of the writer and the reason for crafting the affidavit.This section includes your full legal name, your occupation, and your address first. Then, you will include one or two sentences about why you’re writing the affidavit. For example: My name is Bob Jones. I am a licensed electrician and I live at 1234 Main Street in Any Town, State. I am writing this affidavit because I witnessed a car accident between a red Honda Accord and a green Toyota pick-up truck right in front of my house when I was getting ready to leave for work on the morning of June 8, 2015. Stick to the facts: An affidavit isn’t about your opinion. It’s about facts. In general, one fact per paragraph is advisable. However, the number off facts to include in your affidavit depends on the situation. For example, an affidavit confirming your identity requires fewer facts than one used because you witnessed a car accident. Using our previous example, Bob would list facts about what he saw. He would not include opinions if he knew either driver and didn’t like one of them. Identify the type of affidavit you need; for example, is it for legal needs or personal reasons? Write the heading/purpose for the affidavit. If the affidavit is a sworn statement, be sure to include the name and address of the person giving the testimony (the affiant) in the title (e.g. “Affidavit of John Smith”). Caption of the case must be stated at the top of the document if it will be submitted in court. Write the names and addresses of the parties involved, if you have that information. Even if you know a name and not their address, make sure that you still provide the information you do have. Your opening sentence must be in the first person (an “I” statement such as the example used above) and state that the affiant is swearing under oath that the information contained in the statement is true. Write statements that can be supported by facts next. Finally, it’s time for the signature of the affiant and the date. Remember that the affiant should not sign the form until they are in front of the notary. Relevant court or legal entity receiving the affidavit. Affiant: Person who writes and/or files the affidavit. Oath Commissioner or Notary Public: Person who authorizes the signature of the affiant, signs, and seals the affidavit which authenticates it. Witnesses: Generally, two people are required to serve as witnesses to the authenticity of the document. Given the legal importance of an affidavit, there are a number of considerations to keep in mind. Each and every statement made must be true. Don’t sign it if it isn’t true. If any statements within the document is found to be false, the affiant may be subject to legal consequences. Notarization is another legal consideration. In most cases, an affidavit is only considered legally valid if it is notarized. The affiant must sign the document in the presence of a notary. If the affiant signs it before they go in front of the notary, the notary will not notarize it because they can’t swear that the signature actually belongs to the affiant. In fact, because the document needs to be notarized, you cannot sign online if you choose to use on from the Internet. Additionally, there is the legal consideration of the document’s quality. Is it written in a way that can be clearly understood? Does it contain all of the legal language and the sections that are typically found in an affidavit? A notary serves as an impartial third party who can legally verify the identity of the persons involved in an affidavit. When meeting with a notary, they will require you to provide a legal form of identification. Notaries cannot provide legal advice, so avoid asking them for input regarding your situation. As mentioned at the outset, affidavits are, on the one hand, rather straightforward. On the other hand, there are important nuances involved in their drafting and various uses to remember. Neglecting even the smallest of detail can jeopardize the legality of an affidavit. Therefore, we hope this guide shows you all you need to know to confidently handle any situation involving affidavits in your future. An Affidavit is a legal statement, confirmed by oath, employed for disputes. A Limited Power of Attorney form specifies the scope of authority granted to a named and trusted 'attorney' by a 'principal'. This forward plans for contingencies in given areas of life. It covers: term of delegated authority, amount of actions that might be required, regularity, and limitations to powers. The durable power of authority delegates powers from a named Principal to a named Attorney in fact in specified decision making areas. It is a preparatory document which anticipates the Principal becoming unable to express their wishes in the future. A Non-Compete Agreement is an essential protection for a business entering into collaboration arrangements with external stakeholders or business partners. It prevents the second party from carrying out specified activities which compete with the primary partner for a specified period of time.